There are many opportunities to celebrate Christmas and Easter at The Scarsdale Congregational Church. The young and the young at heart eagerly anticipate our annual Bringing in Christmas and Bringing in Easter events. The Church School Advent rotations in December are much loved by our children, while adults find meaning and enrichment in the special services held during Lent. 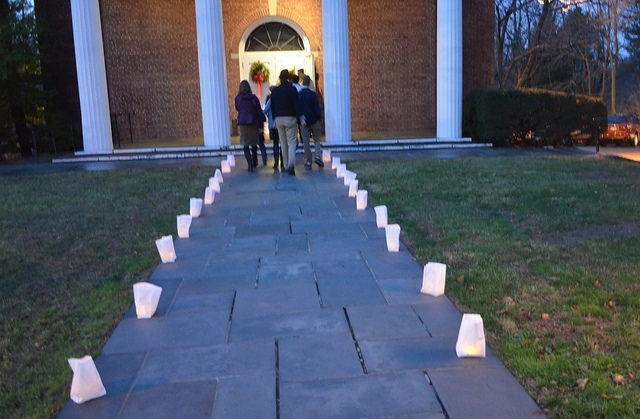 The Scarsdale Congregational Church offers two services on Christmas Eve. There is a family service at 5:00 pm and a more traditional candlelight service of lessons and carols at 10:00 pm. The family service is designed to engage children from toddlers to teenagers. Lasting about 45 minutes, the service is shaped around a simple pageant which tells the Christmas story through reading and carols. This annual event draws a significant number of visitors from outside the congregation. Our traditional 10:00pm Christmas Eve service, conducted by candlelight, includes the reading of lessons and the singing of carols, with anthems by our choir and soloists and a short Christmas sermon. The traditional service ends at about 11:00 pm, and is followed by a reception in the Parish House. Despite the late hour, dozens of people stay for the reception each year, reconnecting and enjoying time together on this happy night. In years when Christmas Eve falls on a Sunday, the Sunday morning worship service is usually canceled. We do not have services on Christmas Day, unless Christmas Day falls on a Sunday. The Scarsdale Congregational Church offers two services on Easter Sunday, a family service at 9:00 am and a traditional service at 11:00 am. Modeled after our Christmas Eve services, there is a family service at 9:00 a.m., followed by a traditional Easter Sunday service at 11:00 am. The family service is oriented towards children. In a simple way, the children help tell the Easter story. The Minister narrates the story in segments, using language that children can understand, while the Church School students act out the story. The congregation participates through word and song. The family service lasts about 40 minutes, and is followed by a special Coffee Hour in the Parish House. Our traditional Easter Sunday service at 11:00 am is a joyous service filled with music, featuring a brass ensemble and a full choir augmented by additional soloists. It includes anthems and hymns, as well as readings and a sermon. It is followed by a special Easter Coffee Hour.